28th April 2012 – Because it was raining, I started welding the wheelhouse floor of the Hornblower. The idea is to make sure no smell or fumes can leave the engine room into the living area of the ship. One thing is already sure, the Hornblower is become a solid ship. The amount of metal added to make her stronger, she will be able to cross rough waters! 28th April 2012 – The floor of the wheelhouse is bolted, so are the L-shape profiles. The bolts were to keep everything in position. Together with the hatch, everything needs to be welded. I ‘ve started today. I’ll see how long it will take. 27th April 2012 – With the little nice weather in the coming days, I finished welding the generator box on the front of the Watergeus. Now it still needs a cover and some decent paint. I’m not sure yet how to mount the exhaust. In the afternoon, with some neighbours, we had a a beer and a laugh. A boat community is a very close group of people with the same sorrows and moments of happiness! Maybe I should start collecting less! 23rd April 2012 – I lowered the generator into the Hornblower. She will supply me of electricity when the batteries are death or when I need extra power. 21st -22nd April 2012 – I left Bruges in the early Saturday morning, heading for London. 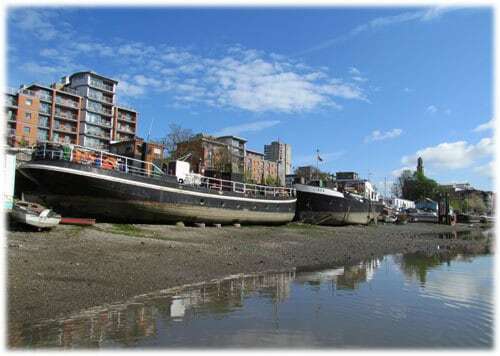 Every year I visit the boats at Brentford, taking some pictures, talk to the people and give a hand if necessary. The difference with the boats over here and in London is that people really live on them. They use the boat to the maximum as possible. Some of them even had nice gardens on the roof, etc… Since the weather was good and the people were friendly it was a great time! On Sunday I made a walk on the muddy beach, taking some more detailed pictures of the barges. 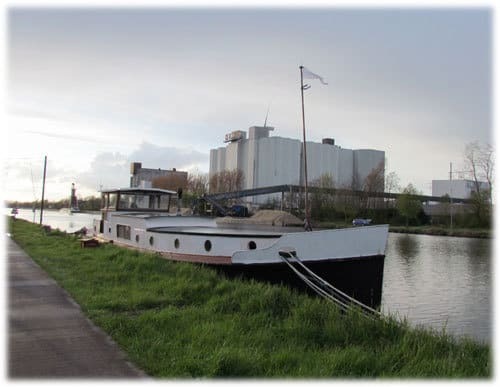 20th April 2012 – One of my friends has a houseboat in Izegem, not to far from Bruges. I bought a generator for the little boat and had a visit afterwards. I always try to follow the ships I’ve worked on in the past. 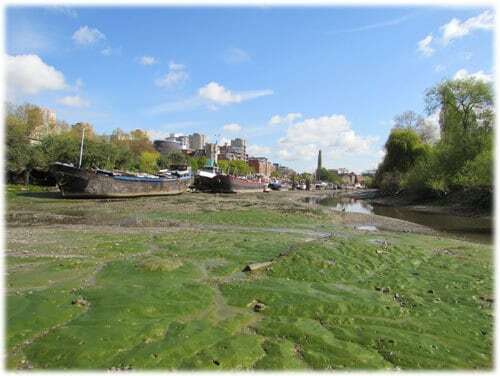 20th April 2012 – The bricks, a washing machine and the hatch have killed my back. After moving around several times with those bricks, I’m not feeling good at all. I know a few of my neighbours who have fitted a few tons of these bricks on their barge! Respect for those who did that! The big old generator I bought in February was to heavy (in weight) for the little boat. Therefore I was in search of another smaller one for the Hornblower. I found another Hatz with Boch dynamo. 19th April 2012 – The bricks are all in position, or at least nearby. With 1200kg of concrete, she is now five centimeters deeper then before. I really wonder how much more she is needing before I can make a safe trip. Later on, I put the hatch aboard my boat. The hatch is a bit to big, but it fits nicely in the wheelhouse. I might have to make some adjustments to the ribs of the floor. I’ll see how far this will take me on a later stage. 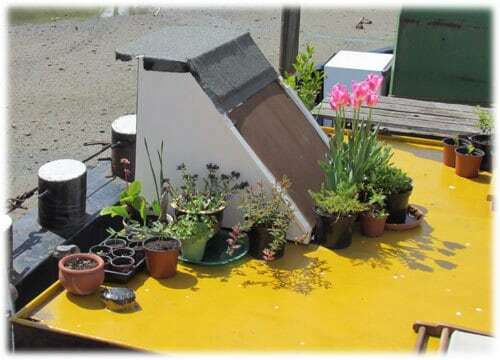 18th April 2012 – I quickly went to Sluiskil to see one of the biggest houseboats at the yard. 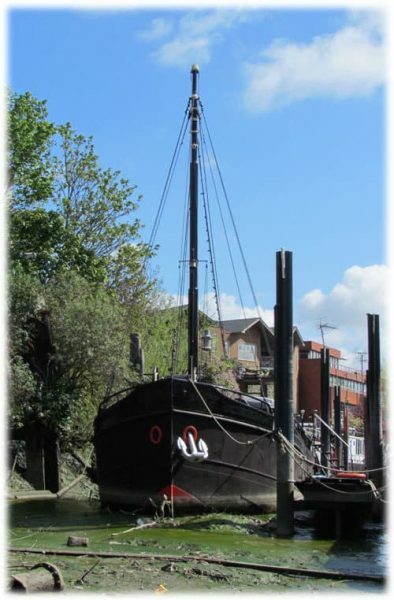 The Rio Claro is 88 meter long ship, moored in Bruges near the old mills. 17th April 2012 – I got my second load of bricks, another 600kg. My neighbour came to help me a hand loading them onto the Hornblower. Once this job was finished, I put some of the bricks in position between the ribs. I noticed with 600kg in the back and 600kg in the wheelhouse, It didn’t make any difference at all. 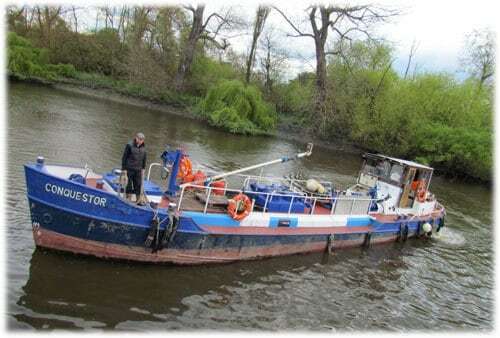 16th April 2012 – After the conversion of the bow, building the bathroom and living area, putting fuel and watertanks in the boat, she was listing sadly towards the front. The propeller started to become visible. This means I need to put weight in the back. The back area is a sleeping room, so this means I will not have enough weight. In a local concrete factory, I could have free concrete bricks of 15cm by 15cm. Each of them has a weight of nearly 8kg. I loaded around 600kg in my car for the first run. I dropped them in front of the boat. A friend from Sluiskil came over, so I had no time to pick up a second load of bricks. I went to have a chat on his boat. 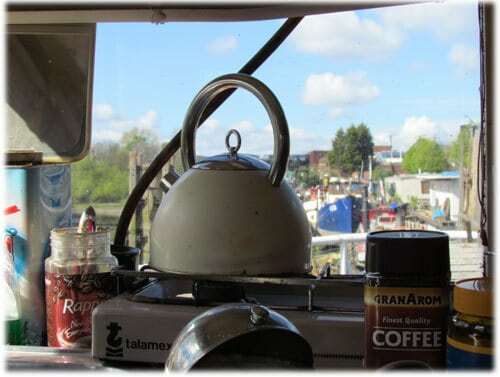 3th April 2012 – I continued welding on the bulkhead between the engine room and the bedroom. This is the last part of the metal construction around the engine.